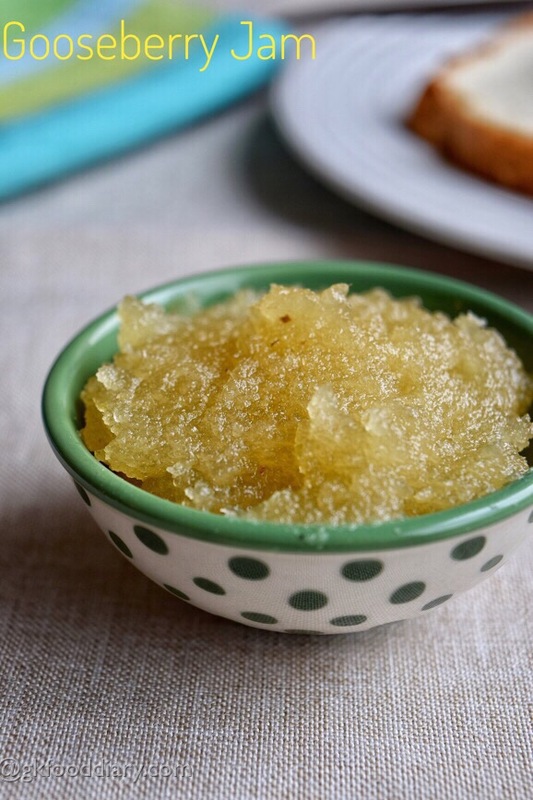 Gooseberry Jam/ Amla Chawanprash/Amla Jam/Nellikai Jam – Quick, homemade, preservatives free, pectin-free jam recipe with Indian gooseberries! Gooseberries are one of the super food for kids, but sadly many kids do not prefer to eat them because of its sour taste. 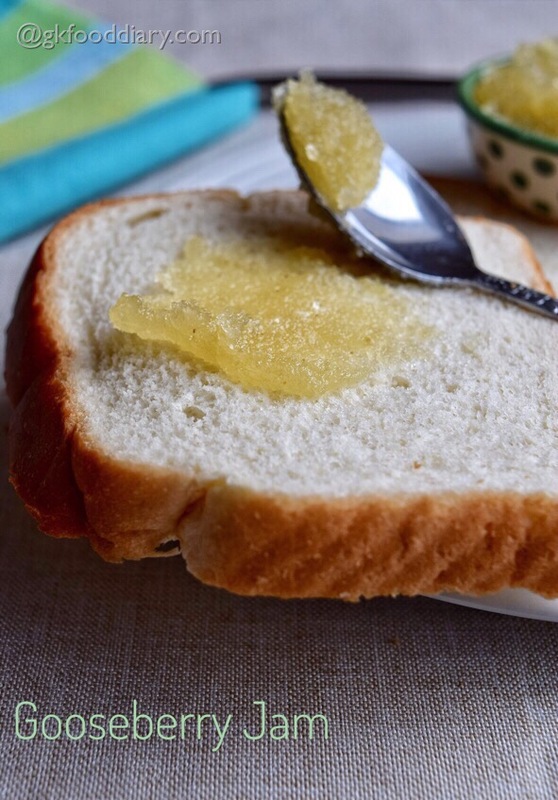 This gooseberry jam is an excellent option to include the gooseberries in kids diet as it tastes good and the sour taste is well balanced with a sweet flavor. It is very quick to make in minutes and can be enjoyed with whole wheat bread, idli, dosa, roti or even as such. This gooseberry jam is ideal for kids above one year after introducing gooseberry separate, one tsp a day should be perfect. Do check out other gooseberry recipes for kids: Gooseberry Rice, Gooseberry Juice. Read more here on when and how to introduce gooseberries to kids and how to select them. Now Let’s get on to check how to make this homemade gooseberry jam recipe for toddlers and kids. 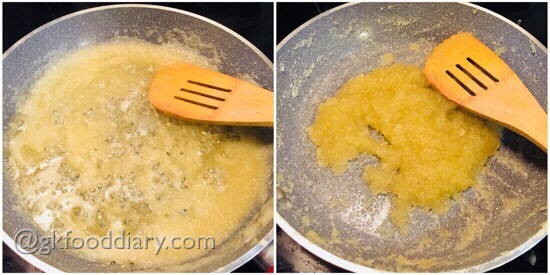 Keep Sugar/jaggery/brown sugar & lemon juice ready. Wash the gooseberries in running water thoroughly with little bit salt. If you are making a larger quantity, pressure cooks the gooseberries first and proceed with the remaining steps. Then place them in cutting board and chop them into pieces. Discard the seeds and take the chopped pieces in a blender. I have taken the whole washed gooseberries. Give a run and discard the seeds (skip this step if you chopped the gooseberries and discarded the seeds already). Then grind them into a slightly coarse or smooth paste. Add little water while grinding. 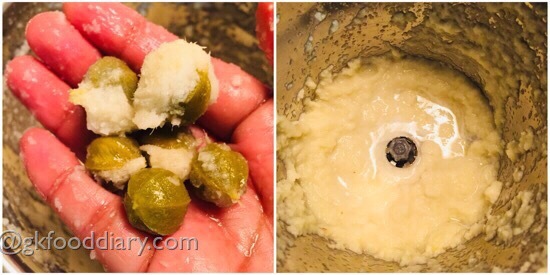 Transfer the pureed gooseberries into a thick bottomed pan and add sugar/jaggery powder, cinnamon powder/cardamom powder along with lemon juice. Mix well. Keep stirring it in low, medium flame and make sure to not to burn the bottom. The mix will start to bubble up nicely, keep stirring. When the jam-like consistency is reached, switch off the flame. 1. 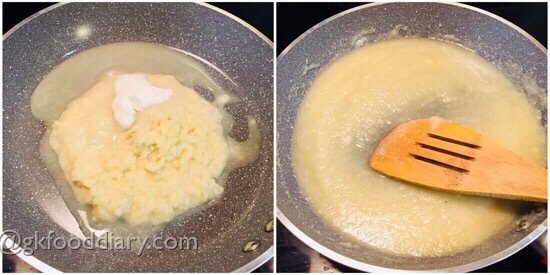 Keep Sugar/jaggery/brown sugar & lemon juice ready. 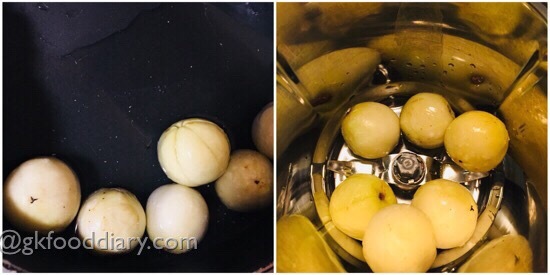 Wash the gooseberries in running water thoroughly with little bit salt. If you are making a larger quantity, steam or pressure cook the gooseberries until soft and proceed with the remaining steps. Then place them in cutting board and chop them into pieces. Discard the seeds and take the chopped pieces in a blender. I have taken the whole washed gooseberries. 2. Give a run and discard the seeds (skip this step if you chopped the gooseberries and discard the seeds already). Then grind them into a slightly coarse or smooth paste. Add little water while grinding. 3. Transfer the pureed gooseberries into a thick bottomed pan and add sugar/jaggery powder, cinnamon powder/cardamom powder along with lemon juice. Mix well. Keep stirring it in low, medium flame and make sure to not to burn the bottom. 4. The mix will start to bubble up nicely, keep stirring. When the jam like consistency is reached, switch off the flame. Delicious homemade gooseberry jam is ready! Gooseberry jam becomes thick when cooled down. Hence switch off the fame accordingly. Adding a dash of cinnamon powder or cardamom powder ensures digestion. Adding lemon juice increase shelf life. Don’t skip it. 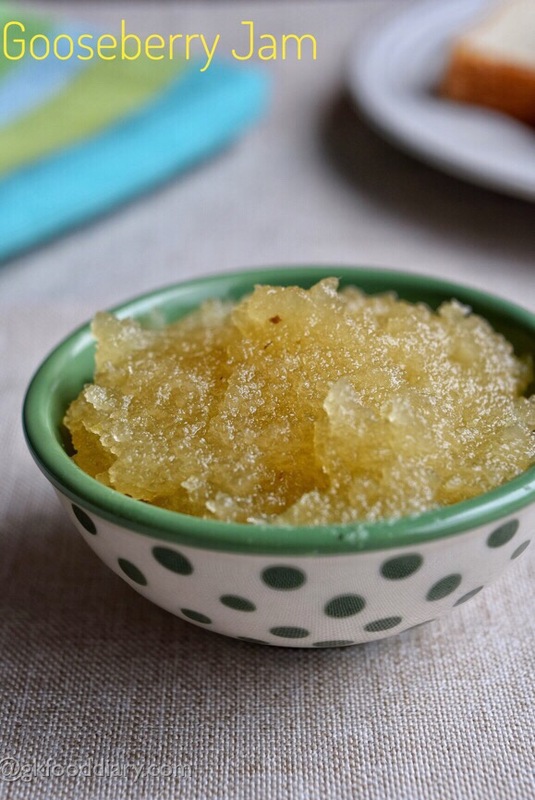 Make sure your kid is not allergic to gooseberries before you try this gooseberry jam. If you are making a larger quantity, pressure cook the gooseberries first and proceed with the remaining steps. 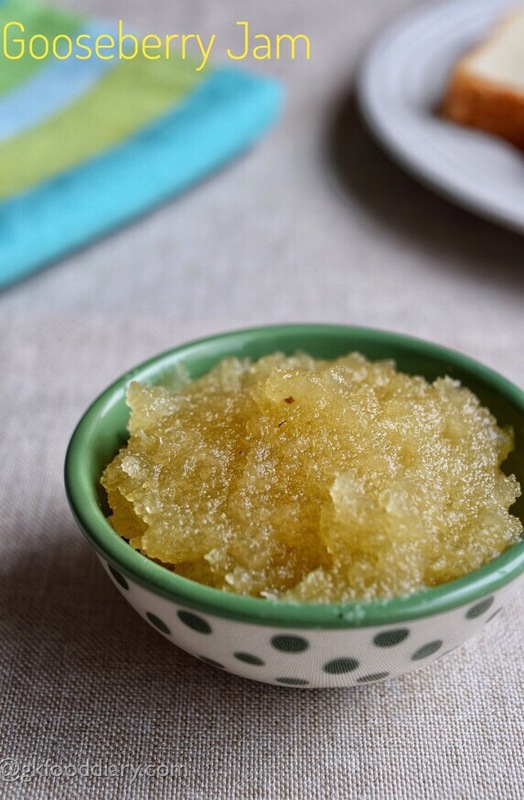 To make it more healthy, I recommend brown sugar or jaggery for making this jam. I ran out of stock so used white sugar this time.